If you have never been to Break of Dawn in Laguna Hills, you have not yet had Orange County’s best breakfast. I am eternally greatful to Kaitlyn for turning me on to this place, and we’ve been several times. 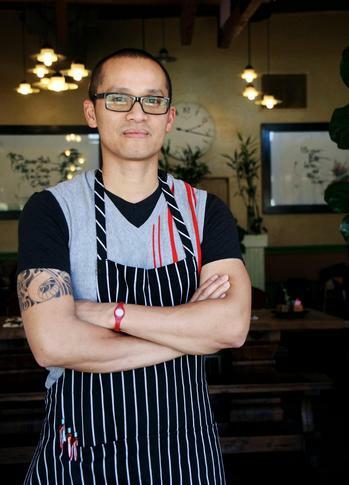 The menu is eclectic, and chef Dee Nguyen is on duty whenever the restaurant is open, wielding his considerable cooking skill and charming personality. Dee has a heartbreaking / heartwarming personal story that will make you like him all the more, but the food is all you will need for motivation, once you try this place. Well, Gustavo Arellano reveals in his column this week that Break of Dawn is planning to serve dinner in 2012, with a limited family style menu. I’ll be there! It is Rosh Hashanah. You need Honey Cake! I wish I could claim full credit for this totally perfect recipe for Honey Cake, but we found it in an article in the September 1, 1999 edition of the Los Angeles Times, by Marcy Goldman. 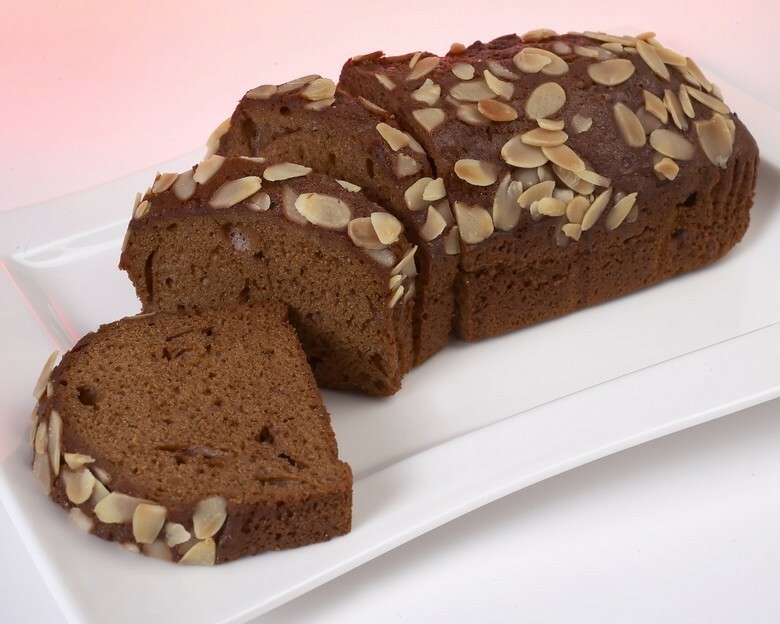 It is delicious, even for people who don’t particularly like Honey Cake! The only change I make is to reduce the oil (see note at the end). 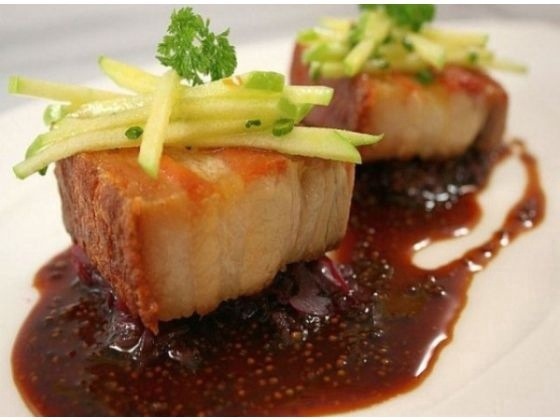 * NOTE: We substitute ¼ cup of applesauce for ¼ cup of oil, and use just ¾ cup of oil. Whisk together flour, baking powder, baking soda, salt, cinnamon, cloves and allspice in large bowl. Make well in center and stir in oil, honey, granulated and brown sugars, eggs, vanilla, coffee and orange juice. Using strong whisk (or electric mixer on slow speed), combine ingredients thoroughly to make thick but pourable batter, making sure that ingredients are all blended and not stuck to bottom. Spoon or pour batter into well-greased 9- or 10-inch tube or angel food cake pan or 2 9×5-inch loaf pans. Scatter almonds over top. Place cake on baking sheet and bake at 350 degrees until cake springs back when gently pressed with fingertips, 1 hour to 1 hour 15 minutes for larger cake, 45 to 55 minutes for loaf pans. Cool 10 minutes before unmolding from pan. 12 to 16 servings. Each of 16 servings: 419 calories; 170 mg sodium; 40 mg cholesterol; 18grams fat; 64 grams carbohydrates; 5 grams protein; 0.19 gram fiber. I just love Anne Burrell, star of the Food Network’s Secrets of a Restaurant Chef. She is down-to-earth and no-nonsense. Nothing too fancy. Everything is simple and efficient, and you can tell she loves food and takes pride in her results. And, she talks like a real person, not a foodie star! 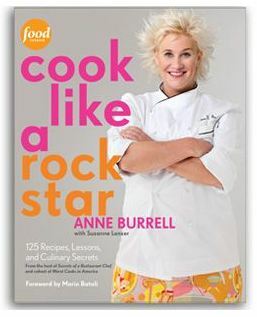 Anne will be in California next week, signing copies of her new Cookbook, Cook Like a Rock Star, at several Williams Sonoma shops. Costa Mesa (South Coast Plaza) is Tuesday, 10/11, and she’ll also be in San Diego, Santa Monica and Palo Alto that week. See the full schedule here. Cantaloupe and Listeria – I’m bummed! I am totally bummed that a Colorado farm has had to recall all its Cantaloupe due to Listeria. Read the FULL ARTICLE here. So far, 72 people in 18 states have become ill after eating the tainted fruit, reporting fever, muscle aches and diarrhea. Thirteen people have died from the infection, but that number could rise with forthcoming test results by state health departments. The bacteria has been traced to cantaloupes grown by Jensen Farms in Colorado, and the fruit has been shipped around the country. Personally, I’ve been scrubbing cantaloupe with hot soapy water, which seems awful to do to food, but is necessary given the dangers. Check out this great article today from Eat This, Not That (Rodale Press) on 7 foods you might not think of when you are trying to include more healthy stuff in your diet. You might be surprised. 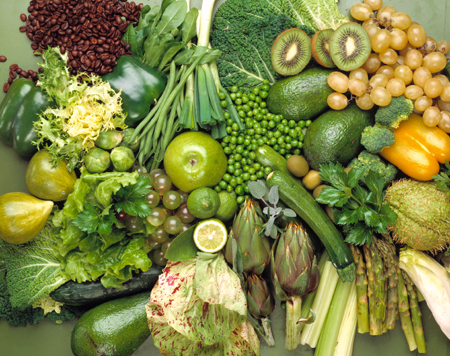 Celery, Hemp Seeds, Kolrabi, Dark Meat (Chicken or Turkey), Lentils, Tomatillos and more. And, they provided the reasons why you should eat them! The one I most want to try: Broadway by Amar Santana, in the former Five Feet space in Laguna Beach. This just opened tiny place with young former Charlie Palmer chef Amar, has a very interesting looking menu, a tasting menu, a chef’s table — lots of promise. Around 1981, my father, who had just sold his very valuable NYC Taxi “medallion” (license), wanted to move to CA and was asking me what to do with his life. I told him to become a merchant, and that I would help set him up. At the time, I was an Architect and General Contractor, and an expert in designing and building retail stores in malls. I had worked in retail as a teen, but really knew little about running a retail business. Within months, we’d secured a lease, and I had researched the coffee store business thoroughly. I realized that you had to feature coffee beans and coffee beverages, but the real profit was in other merchandise, so our store was configured with a wide array of coffee makers, espresso/cappuccino makers, tea pots, serving sets, mugs, gourmet teas, exotic spices, jelly bellies, and other gourmet related items. 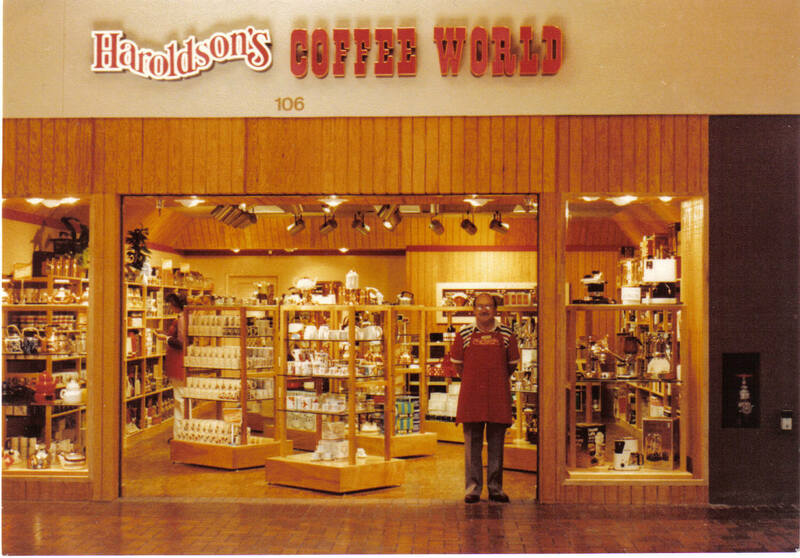 We called the store “Haroldson’s” Coffee World – my father was the Harold; I was the son. We competed for a while with Deidrich’s, which then expanded and ultimately sold out to Starbucks*. The store was in The City Shopping Center in Orange, CA, which has since been razed and replaced by The Block. The store was successful, and I became a bit of an expert in coffee, going to roasters on tasting expeditions, and discussing with our vendors the various types of beans, how they were roasted, etc. At Christmas time we had lines out the door for our famous Haroldson’s Gift Pack, 4 – ½ lb bags of coffee, either whole bean or ground to order. These sold for about $12, and were a perfect hostess gift at the holidays. My father was the quintessential merchant – the little bald guy in an apron – but also a bit of curmudgeon. However, he had a very sweet, generous nature, and the staff enjoyed working for him. One of our former employees, Deana, who has gone on to be a PhD professor, wrote a blog a few years ago that I just stumbled upon. It was a very touching reminiscence! We’d opened two other retail stores with a different concept – Happy Hearts was heart, rainbow and unicorn type merchandise, but we sold those within a couple of years. We hung on to Haroldson’s. I was concerned about my Dad being able to do 10 hour days as he approached 70, so we sold the store at the peak of its value, about 4 years before that mall was demolished! The new owners opened one or two stores under the same name, but none are still around. My dad continued to work in other jobs until he was 86! He passed away 4 years ago. It was fun being a retailer for a while. But, I was doing all this while still running other full-time jobs, raising a family, and it was tough to do it all. * So, you might ask, what do I think of the Starbucks-ization of the coffee business? I really believe that independents have something to offer that transcends the chain approach. I once stopped in at an independent up in the Pacific Northwest, that gave away bumper stickers that read “Friends don’t let Friends drink Starbucks!” I know half of American coffee drinkers are addicted to Starbucks, so at great risk let me say that I think Starbucks always over-roasts their beans. It is a good way to hide mediocre quality raw beans. Certain coffee beans should be roasted less, to bring out their more delicate flavor nuances. Peets does a better job, and by the way, Peets was the store that most impressed me up front, when I did my initial research back in 1981 (visiting several of their Bay Area locations). They manage to keep a bit of that independent flavor. BUT, please seek out and support independent or very small chain coffee merchants – it’s the American way, and it will taste better.